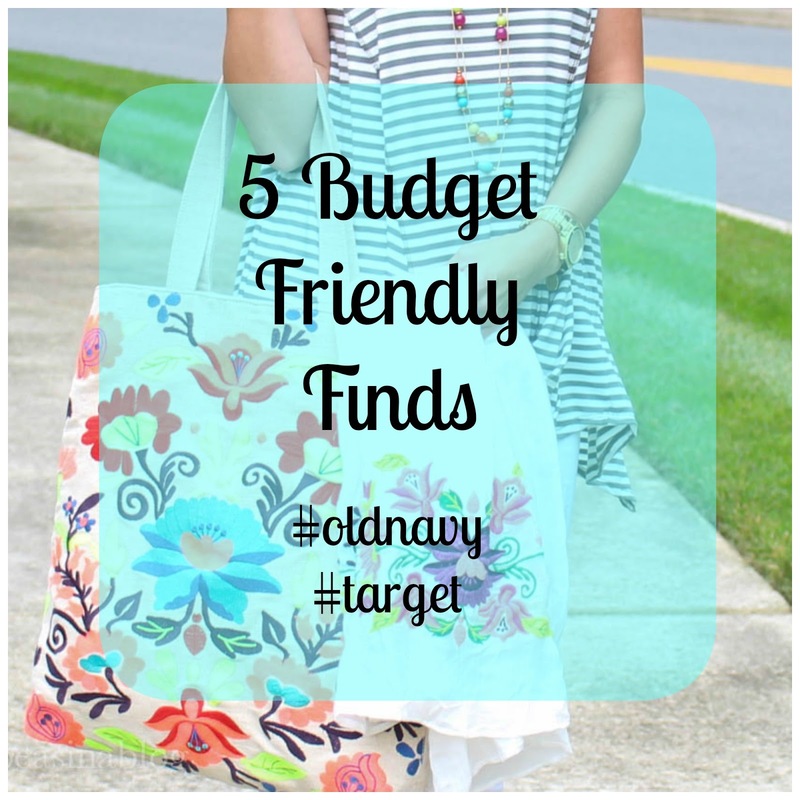 Today is the 5th and final Budget Friendly Find of the week. I hope you enjoyed the theme this week. It's great knowing there are fun and trendy pieces out there that won't break your budget. 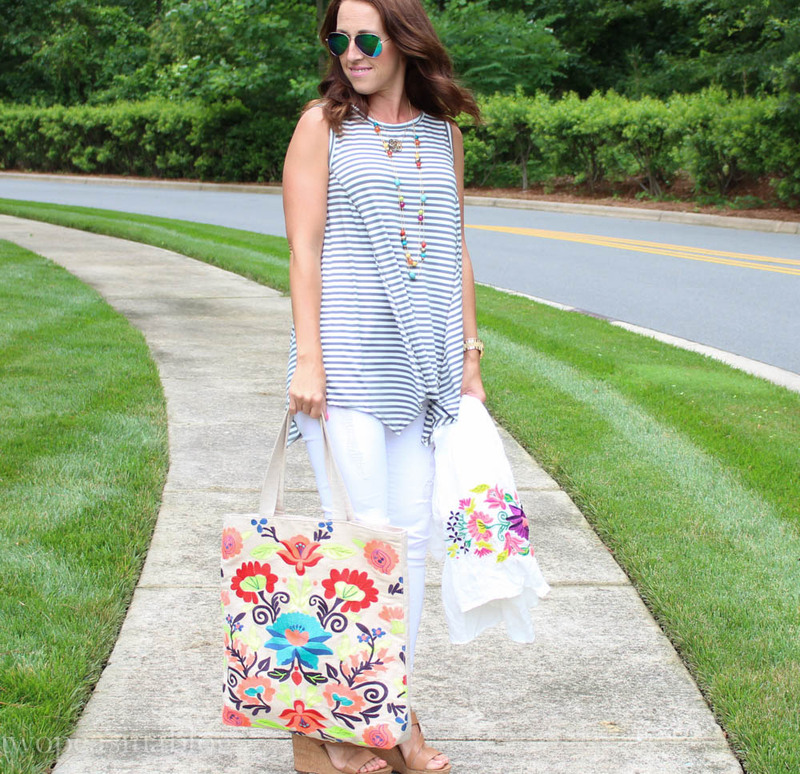 I love mixing these budget friendly pieces in with some higher price items. Today's Budget Friendly Find is the accessories at Target. I go to Target weekly for my groceries and household items, but I always walk through their clothing and accessories too. 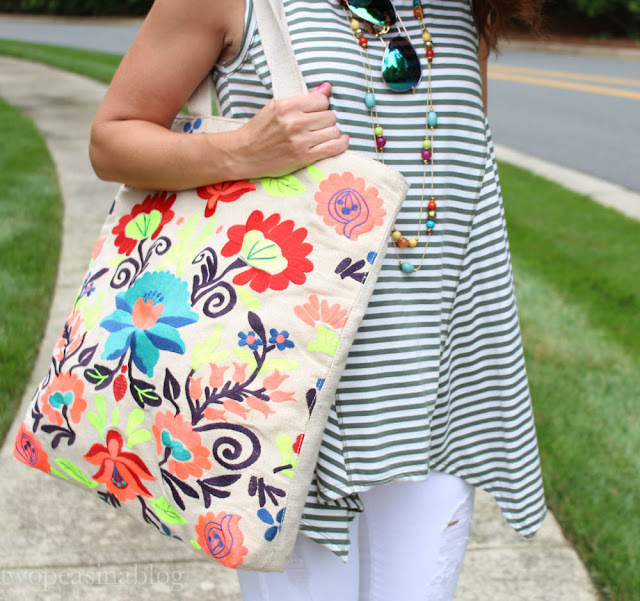 They have some fabulous bags, like this tote in this post. I love the neon colors and the size of it. It really adds to my outfit. 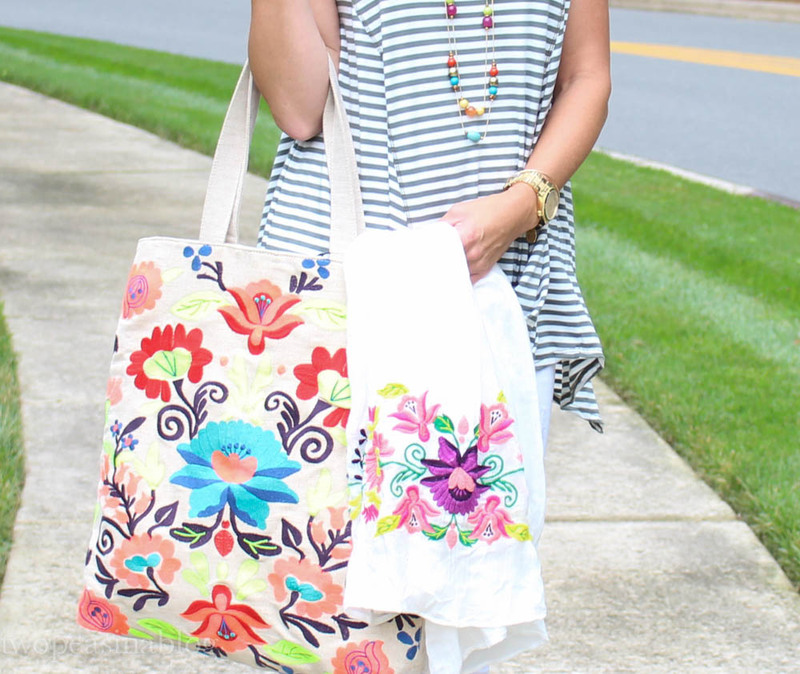 I also love this denim stripe tote, this tote with it's amazing cut-outs, and this tote with it's bright tassels! Target also has a huge selection of scarves. A light scarf is perfect for a chilly summer night, or to tie around your hips as a swimsuit coverup. 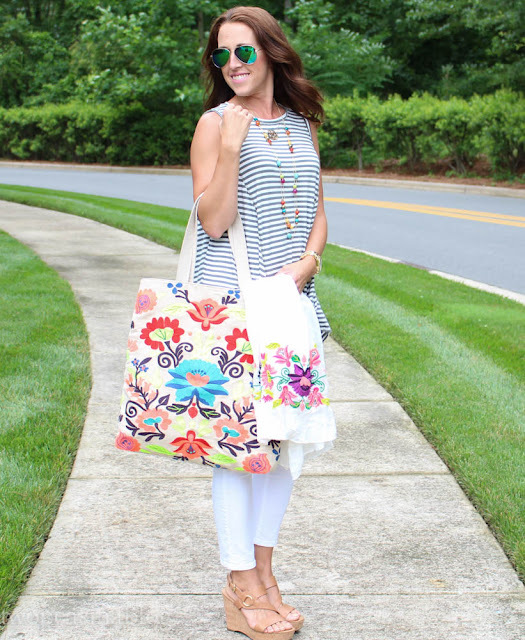 I found this white scarf with neon embroidered flowers and think it's perfect with the bag. And of course, an outfit isn't complete without jewelry. This long beaded necklace is beautiful. I can see it going with so many of my summer outfits. The beads in it will pair perfectly with whites and neutrals and also my favorite bright neon colors. I also think this is a great statement necklace with a hint of tortoise shell. Have a wonderful weekend. The sun is finally supposed to come back out here after a week of gloomy rain. ok i totally need to hit up target this weekend for that tote!! I love this look, Betsy! 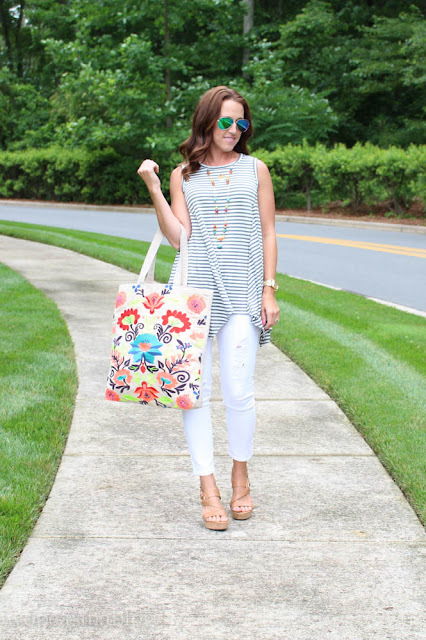 The striped flowy top paired with the white skinny jeans looks amazing and I love all of your pops of fun color! Thanks for linking-up with Friday Favorites! LOVE this look! I had to pin some of these pics, they are super cute!! Great finds and I have had my eye on this Target tote for a while! It is so deep that I worry I will be digging forever trying to find my keys, haha, but it is perfect for my laptop or even to towels when heading to the pool! Love that trapeze top! Found a similar one at F21 but I'm still contemplating whether I should buy it online or check it out in store first. Haha! 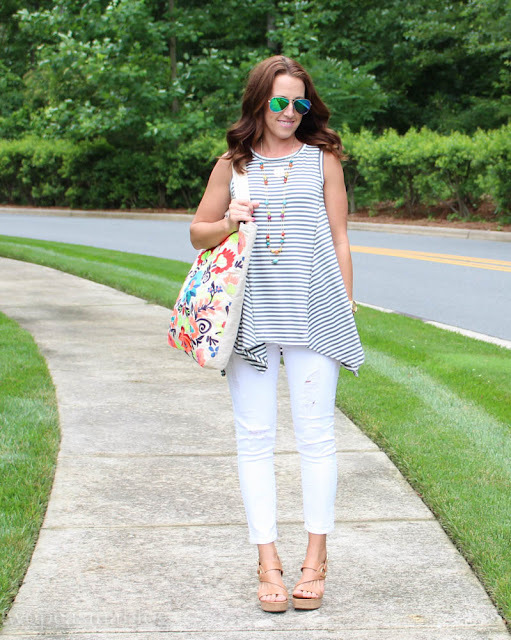 From the shades to the shoes, this look is perfect! I would totally wear it! You look awesome. 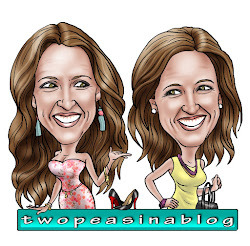 Thanks for linking up with us for Passion4Fashion! Hope to see you back next week! Have a great weekend! Love it! What a fun pattern and color palette! 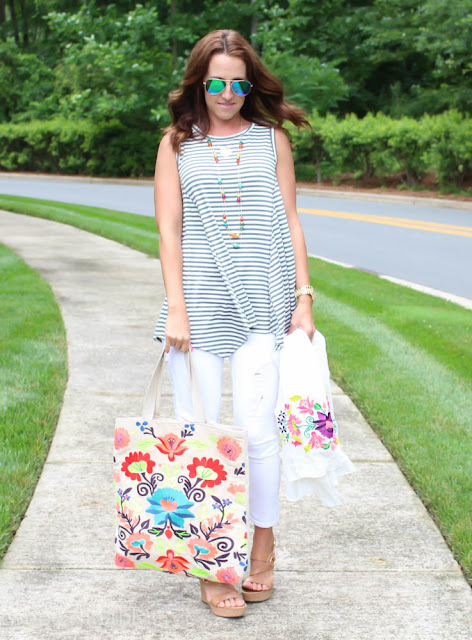 love that you mixed stripes and patterns!! that flowy top is so cute -- i need to mosey over to a target one of these weekends! 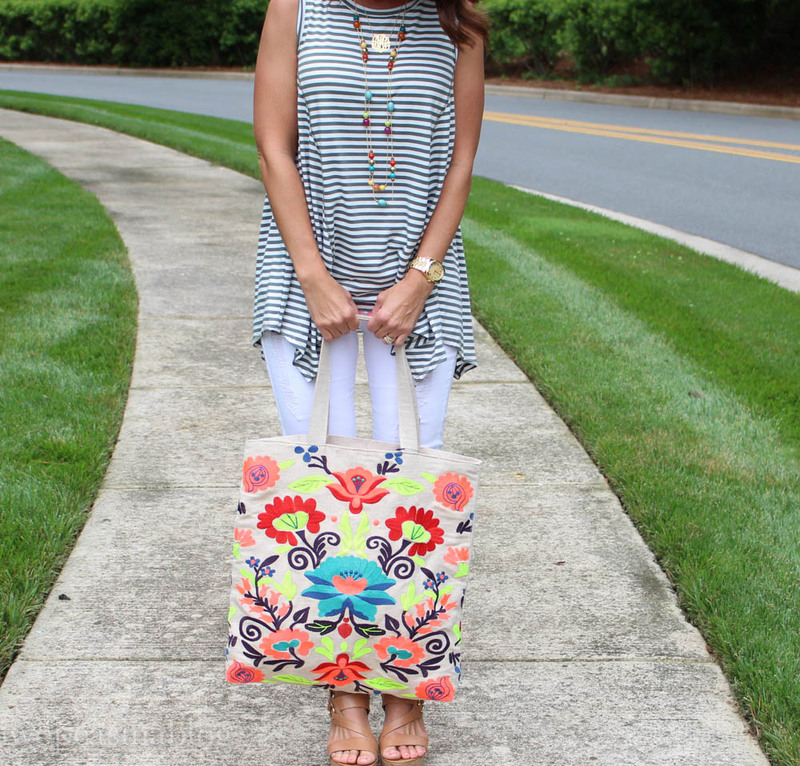 wow so in love with this tote! I need to head to target soon I have seen so many amazing things from there lately!!! That tote is so pretty! I love all the bright colors in it! 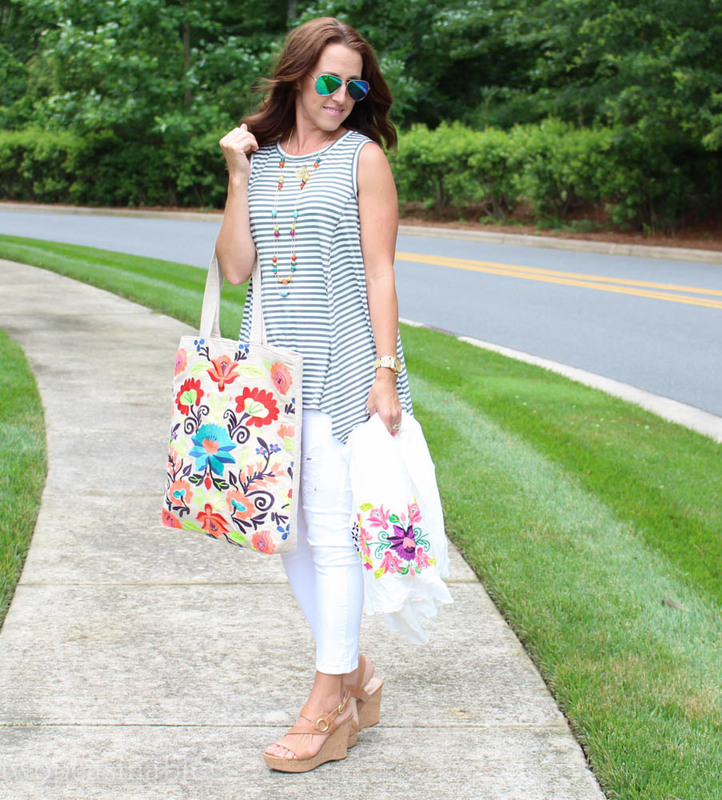 I love mixing stripes with florals. Great choice! Seems like we have similar Target taste, I have that white scarf and the clutch version of the tassel bag! Great picks!